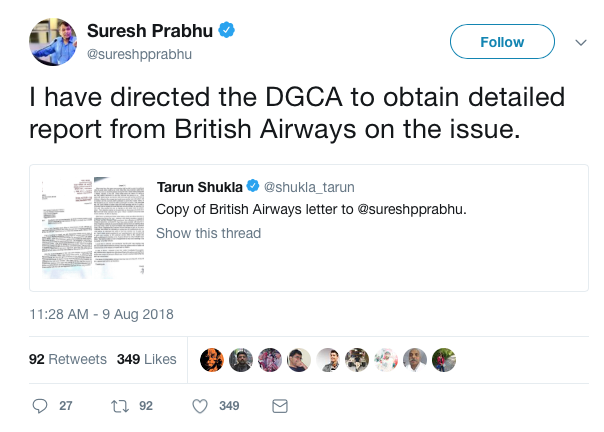 India's Civil Aviation Minister Suresh Prabhu has asked for a probe into claims that British Airways ejected an Indian government official and his family from a flight at London City because their three-year-old son was crying. The incident has led to a storm of protect on Twitter in India, with some social media users calling for British Airways to be fined and others urging passengers to boycott the airline. AP Patak, who works for the Indian government, wrote a letter of complaint to minister Prabhu about the 'humiliation and racial behaviour' he claims he endured on the flight to Berlin. Prabhu said it a Tweet that he had asked the General Directorate of Civil Aviation in India to ask BA for an investigation. 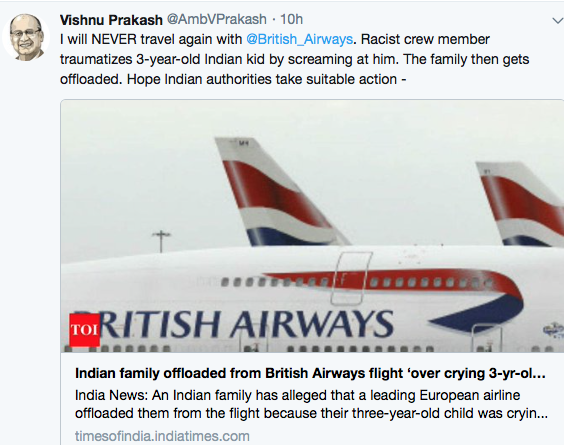 Patak claims a male crew member shouted at his son and used racist remarks towards him and his wife before ordering them and another Indian family sitting behind them off the plane. He said that his son was crying because he didn't like sitting alone in his seat, but when his wife lifted him up, the crew member shouted at them and insisted the boy was put back on his seat. When the child continued to cry, the steward allegedly told him to 'bloody keep quiet otherwise you will be thrown out of the window'. Patak claims the aircraft then returned to the terminal and security personnel were removed his family and the family in the row behind who had offered his son a biscuit to try to calm him. 'I would like to reiterate and emphasise that the said crew member made racist remarks and used hatred words like "bloody" about the Indians which is highly undesirable and contumacious to the respect of myself and my nation,' he said in his letter. BA said in a statement that it was investigating the incident and added: "It is a safety requirement for all airlines that passengers are seated and have their seatbelt fastened for take-off. "We are investigating the complaint and will liaise with our customer. Thrown off for kid crying? No. Thrown off for offering a biscuit? No. Bloody a racial comment? No Rude? Yes. When the full story is known I think this complainant will be embarrassed.